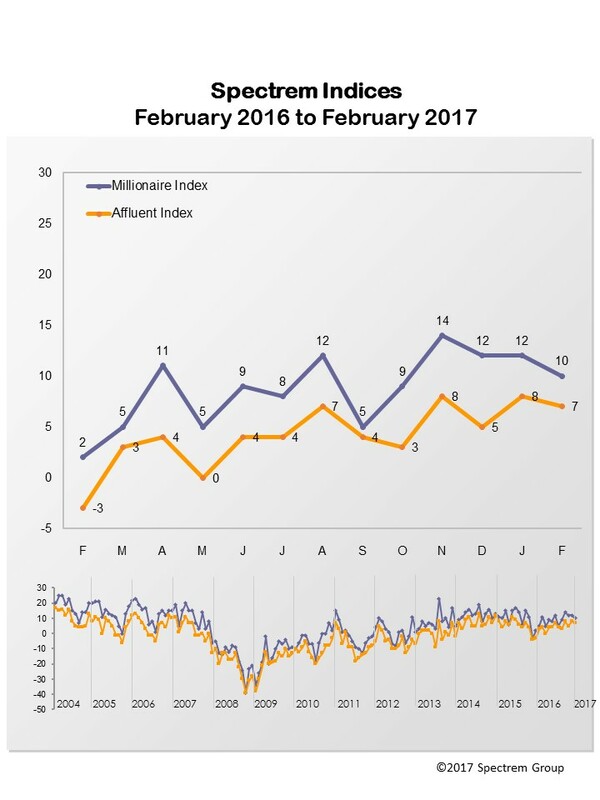 Despite a continued robust market in February, the Spectrem Affluent Investor Confidence indices were flat in comparison with the previous month. The Spectrem Affluent Investor Confidence Index (SAICI®) dipped 1 point to 7, while the Spectrem Millionaire Investor Confidence Index (SMICI®) lost 2 points to 10. But each is up markedly from February 2016. The SAICI is up 10 points and the SMICI is up 8. One of the drivers of the Spectrem investor confidence indices, the Spectrem Affluent Household Outlook, was also flat for the second consecutive month. The Outlook is a monthly measure of financial factors that impact the daily lives of Affluent investors. But here, too, all the components of the Outlook—household assets, household income, company health and the economy-- are up in comparison with February 2016.
Notable in February was a surge in the Spectrem Non-Millionaire Household Outlook. The Millionaire Household Outlook is generally higher than it is for non-Millionaires, but in February, driven by the highest level of confidence in the economy in two years, non-Millionaires closed the gap to within 2.6 pts., the narrowest margin since October 2016.